Gamma-ray sky around the Westerlund 2 region. The extended bright source in the North is the HESS J1023-575 / HESS J1026-582 complex, see SOM 4/2010. As a result of deep observations of the Westerlund 2 region (SOM 12/2006 and SOM 4/2010) a new source of VHE gamma rays emerges south-west of the source HESS J1023-575 (top image). 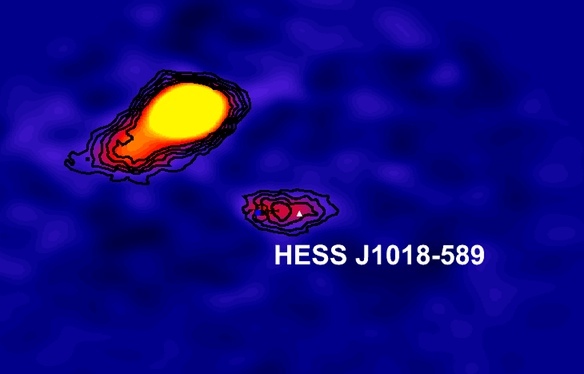 The new VHE gamma ray source HESS J1018-589 is detected with a significance of >8 sigma. The emission region coincides partly with the supernova remnant shell SNR G284.3-1.8 and with the pulsar PSR J1016-5857 (Fig 1, Fig. 2). G284.3-1.8 is an incomplete radio shell (Milne et al. 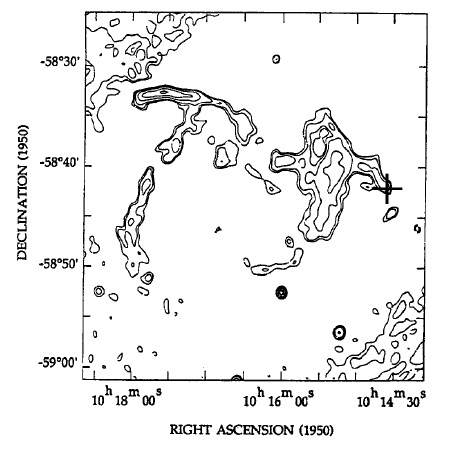 1989) interacting with molecular clouds (Riuz & May 1986). The radio pulsar PSR J1016-5857 (Camilo et al. 2001) has a rotation period of 107 ms, an age of 21 kyr and a spin-down luminosity of about 3 x 10^36 ergs/s. It lies outside the shell, and whether remnant and pulsar are associated is not clear. The very rough distance estimates for the pulsar (9 kpc) and for the remnant (3 kpc) differ significantly; on the other hand, in the radio image the pulsar appears connected with the remnant by a trail-like "finger" (Fig 1). In particular for the closer distance, the pulsar would provide an ample source of power for the VHE gamma ray source. Chandra observations of PSR J1016-5857 indeed show an X-ray pulsar wind nebula created by a population of high-energy electrons (Camilo et al. 2004). AGILE claims a marginal detection of pulsed gamma-ray emission (Pellizzoni et al. 2009); the steady Fermi source 1FGL J1018.6-5856 (Abdo et al. 2010) overlaps with the HESS source, but is somewhat offset from the pulsar. XMM X-ray observations initiated after first indications of the HESS source (Fig. 3) show thermal X-ray emission from the Northern part of the shell, as well as a new point-like source of non-thermal X-rays inside the remnant. Further work will be required to determine if the VHE gamma ray source is associated with the pulsar PSR J1016-5857 or with the remnant. Fig. 1: MOST radio map at 843 GHz of SNR 284.3-1.8 (Milne et al. 1989). 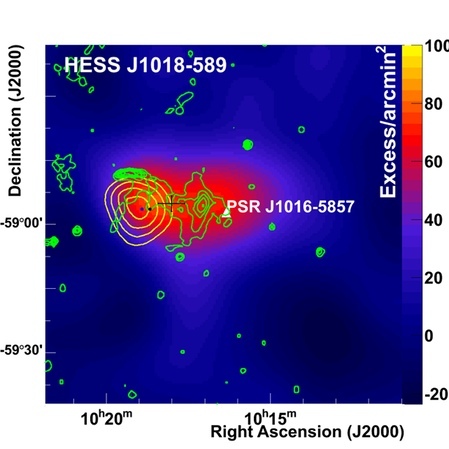 The location of the pulsar PSR J1016-5857 is indicated by the cross (Camilo et al. 2001). Fig. 2: VHE gamma-ray image with superimposed radio contours as in Fig. 1. The cross showns the centroid of the gamma-ray emission, the triangle the location of the pulsar. Fig. 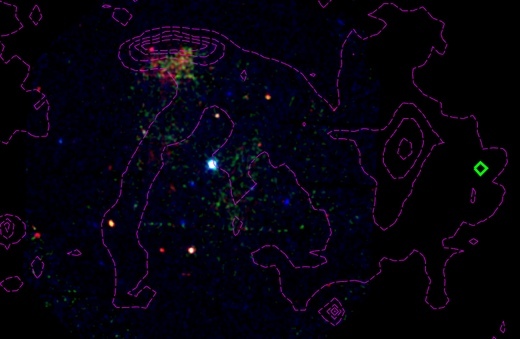 3: XMM 3-color X-ray image of the G284.3-1.8 region (red: 0.3-1.5 keV, green: 1.5-1.7 keV, blue: 1.7-9 keV). Superimposed are the radio contours. The blue square indicates the pulsar location.